“TOWN”: A “Town” is a form of local government. A “township” is a geographic surveyor’s unit measuring six by six miles square. Many towns, but far from all, have roughly the dimensions of a township. CITIZENS: 1,709,491 Wisconsinites live in a town, or 30.1% of the state’s population. LAND AREA: 95% of Wisconsin’s land area is within a town. TRANSPORTATION: Towns maintain 61,996 miles of town highways. That is approximately half of the 112,362 miles of public highways of all types (federal, state, county, city, village and town) located within the State of Wisconsin. GOVERNANCE: An elected town board composed of a chairperson and 2-4 supervisors; an elected or appointed clerk and treasurer or combined office of clerk-treasurer; some towns also choose to have additional elected officers, such as a constable or elected property tax assessor and some towns retain a deputy clerk, treasurer or clerk-treasurer. SERVICES: All towns must: operate local polling places for elections; conduct property tax assessment, dispute procedures, billing and collection; ensure fire protection and ambulance service; ensure that there is a recycling program; and maintain town highways. Many towns also choose to provide additional services at the local level such as garbage collection, land use regulation and law enforcement, etc. CREATION: Wisconsin Constitution, Article IV, Section 23. The first white man to set foot on Wisconsin soil was Jean Nicolet, who was sent here by Samuel Champlain, Governor of New France, Canada. The idea at the time was to find a short route westward to India and China. In July, 1634, furnished with a few imperfect maps, Nicolet set out in a canoe to make peace with the Indians and open new territory. Many priests followed and Father Claude Allouez built the first chapel in Wisconsin in 1665, near Ashland and Washburn. Following the priests and missionaries were the fur traders who heard of the vast amount of furs in this area. Notable among the fur traders was Nicholas Perrot, who in 1665 began a career of exploration and discovery in Wisconsin, which lasted more that 30 years…to about 1695. The king of France staged a pageant on the far shores of Sault St. Marie, at which the representatives, Simon Francois Daumont and Sieur de St. Luson, took possession of all the Western country for the French sovereignty. Nicholas Perrot was notified in advance to have all Wisconsin tribesmen send their chiefs for this great occasion, and there they persuaded the Indians to let them annex this country to France. Later Nicholas Perrot became governor general of the new French territory west of Lake Michigan. He built a number of French posts. As long as he ruled in the West, the French trade and influence was supreme. Many Frenchmen came to this territory and manned these posts. The traders were licensed by the French government and were under strict regulations. Unlicensed traders went farther into the wilderness, traded his wares with the Indians and sold his furs to the Hudson Bay Co. This caused so much trouble that the French governor revoked all licenses and in 1696 ordered all posts evacuated and all traders and soldiers to return to Ottawa, New France. Some of the soldiers, among them Jean Francois St. Germaine who had married an Indian maiden, rather than return to New France and face charges, deserted the garrison and settled with the tribe of which his wife was a member. Many years passed of which there seems to be no record of the St. Germaine family. Later we find many members of the St. Germaine family with the Lac du Flambeau band of Indians, whose chief was Keesh-ke-mum, or Sharpened Stone, who was one of the greatest Chippewa Chiefs. The Chippewa sold all their lands by treaty in 1842 but continued living in the area. Later they moved to the Lac du Flambeau reservation as the white man moved into the territory. One of the first white men to settle in this area was James Lynch, a Canadian, who came here in 1842 to trap. He married an Indian maiden named Ramona. Nine children were born to the couple; the oldest was Biddie who later married a St. Germaine from Lac du Flambeau. In 1857, the U.S. government sent surveyors into the area. 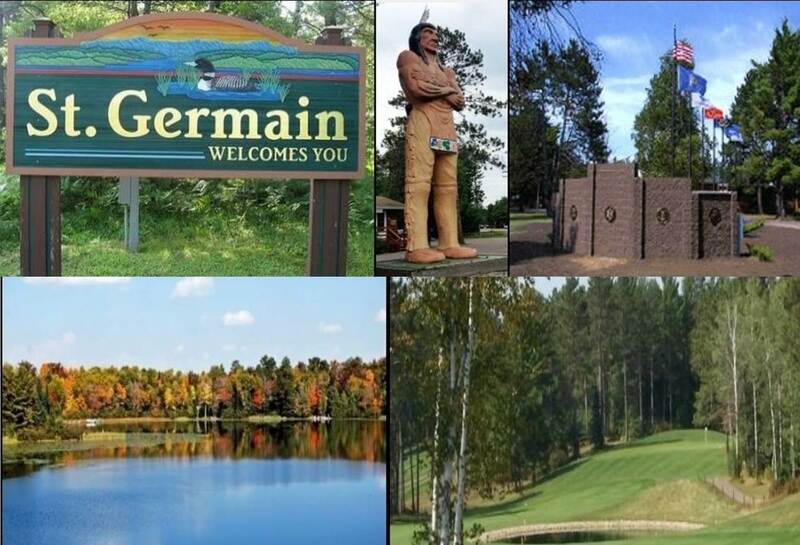 Their records show that Big St. Germain Lake was named St. Germain Lake by the Indians. Records also show an Indian burial ground on the south shore of the lake. In August of 1857, John Curran and Dutch Pete came up the Wisconsin River by canoe from Merrill to Eagle River, with many portages over the rapids. They mention passing St. Germain Creek (now Rhinelander) and Otter Rapids (near Eagle River). According to Mr. Curran, the St. Germain Lake was named for a beautiful Indian princess whose tribe camped on their shores. In recognition of all our veterans, it was the initiative of the St. Germain Lions Club to spearhead the planning and completion of the Veterans Memorial Wall. 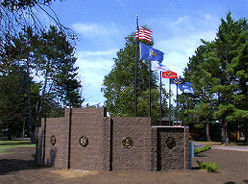 The Memorial Wall that stands today serves as a reminder of all the men and women who defended our country in times of war and peace. The walls are comprised of 820 bricks with the names of veterans (living and deceased) who served in our armed forces. 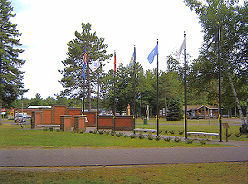 155 & 70 as "Veterans Park". building of a Veterans Memorial and at that time a committee was chosen. Bill Sunderlage, Frank Johnson, Ron Hutts, Craig Callies and Fred Radtke. market and through ads in the newspaper. number 532 that completed the five walls was sold in September 2001. 288, which completed the second phase was sold in November 2002. Guest speaker Col. Scott McFarland. A fly over by J. Berntlinter. Eulogy by Pastor Joe Hueneman. Members from the five services raised the flags. Town Board Chairman Brian Sherren and the Town Board were present. The VFW and the American Legion were represented by George Stevens (Three Lakes) and Bob Means (Eagle River). The Honor Guard was from the VFW Post, Three Lakes. Band music provided by the Northland Pines High School.